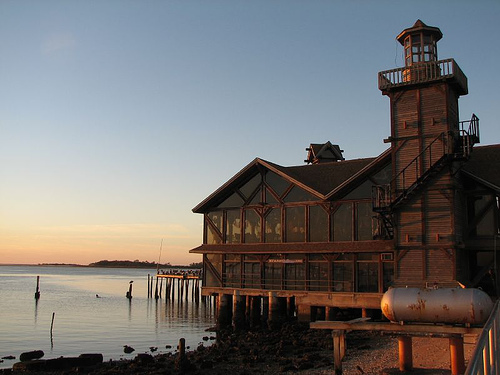 Cedar Key is a quaint town off the beaten path, lost in time and perspective. She sits perched precariously on the edge of the Gulf of Mexico, swaddled in salt marshes and mud flats, a time capsule left to fend for a tenuous future and to forget a nostalgic past. The town is similar to the song, ‘A little bit country, and A little bit rock and roll,’ boiling over with enthusiasm and feet stuck in the muddy mixture of natives, renters and tourists. Cedar Key has the ambience of Key West without the bars, the Duval Stroll, Mallory Square, the chickens, hip stores and boutiques, the eclectic people wandering the streets, water sports, the fine dining and conch critters, the cruise ships, the tourists, the resorts, ethnic bakeries, a state park with great swimming areas, tour guides and tram rides. Cedar Key does, however, support a feral cat population. The pier is undergoing renovation and gone is the old man that entertained the masses by feeding the pelicans with his nightly show. 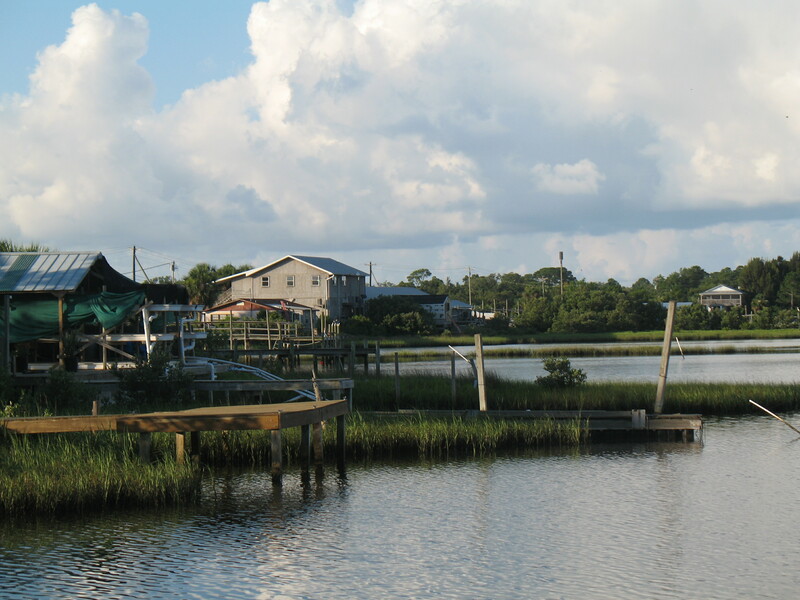 Cedar Key has daily access to gorgeous sunrises and magnificent sunsets — surrounded on all sides by crystal waters and smelly bogs. 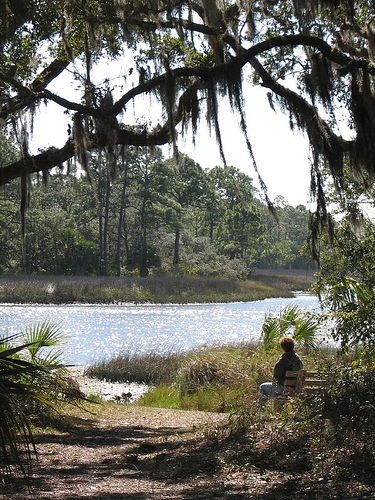 Walking trails meanander through the wilds and brambles along the seashore. A newly-built boardwalk wraps around the cemetery and deposits travelers along the bay to fish, relax, swim or take a few photos. Locals bypass the walkway and drive right through to the back portion of the cemetery, park their trucks and trudge to the water’s edge for net fishing and guzzling a brew. It’s a working town whose livelihood depends on Mother Nature — not always a helpful participant. For many workers, a tidy home and well kept yard is not an asset, but rather: a hindrance. Fishermen swarm in as if they were fish during spawning season. Fancy fishing boats hug the docks and cruise the waters. Mullet jump out of the water for reasons not clearly defined. Bring your own boat, rent a kayak or take a sunset tour. Rent a golf cart to tour the island in style. Or perhaps rent a scooter from the local grocery store. It’s a place smothered by neglect and decay. Trash lines the ditches, the waterways, and the odorous salt marshes. Dilapidated buildings cry silently with despair being their only salvation. Restaurants with bland food and overpriced menus litter the harbor in competition with the feral cats. A few campgrounds survive on the edge of destruction and denial, barely making a statement. Instant friends and campfire buddies line the wobbly docks to view the nightly painting of the sky. Quiet contentment spills over the mesmerized campers. 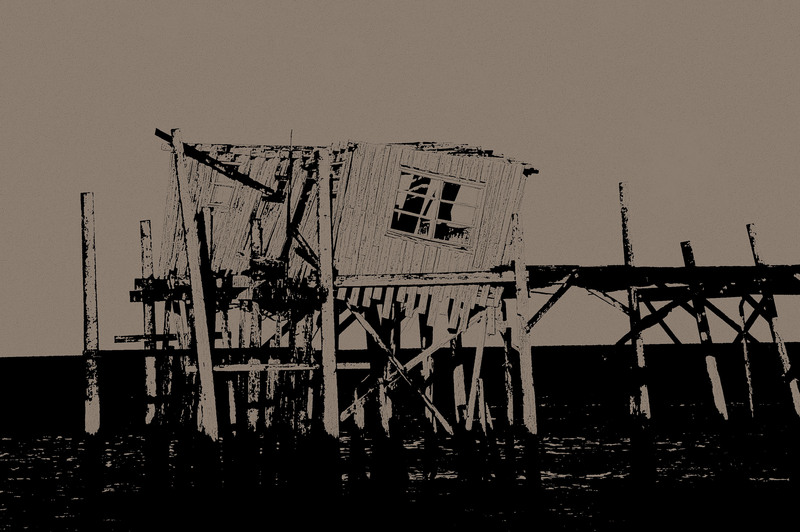 Broken roads filled with potholes, hollow dreams littered with debris, buildings in disrepair and a cottage on stilts in the final phase of death define the town. A puddle jumper plane glides gracefully on the small air strip. The sounds of laughter mingles with the cry of the seagulls. It’s a place overflowing with a salty ambience and an air of yesteryear, where survival meets economic decline. 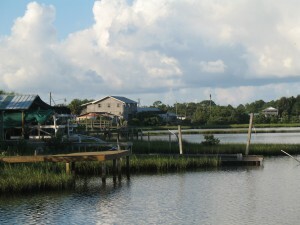 Sit on the lopsided dock and listen to the sounds of nature and man. Air boats flash by making a noisy statement next to the fishing boats that drift lazily with the tide. The orange evening sun explodes across the sky painting a mural of distinction. Birds cry in misery or perhaps ecstasy. The tides crash with a single purpose against the weary shoreline. Cedar Key ages with a less than graceful swan dance. My fears are that one day I will visit and enter the twilight zone of a ghost town. This entry was posted on Tuesday, July 29th, 2008 at 7:06 pm	and is filed under Built Environment, Geotagged, Physical Geography, travel. You can follow any responses to this entry through the RSS 2.0 feed. You can skip to the end and leave a response. Pinging is currently not allowed. Nice choice of photographs. There is definantly a sense of hometown feel to this type of article post which is really captured by the last photograph with someone sitting by a creekbed staring off into the distance. This always seems to be a country/ small town sort of pose where you have someone staring out into the distance. One never really see these sort of photographs captured for photographs of the city. One is always looking at something (having a fixed destination in mind) whereas the more rural locations have one staring out into the horizon. A very romantic sort of imagery. Aine Lyons lives in Florida, land of the lost and found. There, she writes, she photographs, and she teaches.